The summer of 2010 was a wild and crazy time for the founding members of Lunarch Studios. For many of us, it was the first summer we’d taken off in years, so there were Vegas poker adventures, marathon gaming contests of extreme proportions, and many nights spent watching Korean Brood War streams until sunrise. Inventing new games had always been a hobby of ours, so many of our marathon sessions involved competitive games of our own creation. To match our fiercely competitive nature, these “Classic Lunarch Games” tended to be ludicrously difficult and grueling. We’ll describe a few in a future article, but to give an idea, let’s just say that one of our favourites involved playing Starcraft: Brood War (itself a rather gruelling game) against an opponent at the highest speed, while on a second computer, simultaneously racing that same opponent to be the first to program a correct solution to a computer science olympiad problem. It was during this summer of intense gaming that Prismata was born. In stark contrast to many of our other “Classic Lunarch Games”, Prismata wasn’t brutal or grueling; it was actually quite relaxing to play, yet still intensely skill-testing. 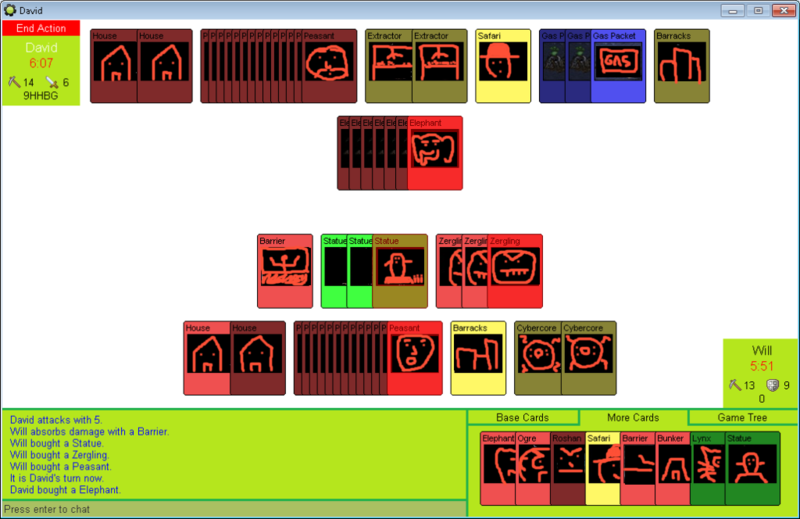 The first version of the game was essentially a freak accident; the original idea arose in a conversation after a marathon session of Dominion, in which we discussed ways to deepen the game by reducing the amount of randomness. One thing led to another, and we were soon discussing combat systems, build-orders, tech trees, resource types, and various other mechanics borrowed from RTS games and TCGs. A few days later, Will showed up with a stack of colourful index cards covered in scribbles, held together by a rubber band. In his hands was the first version of Prismata. At first I was a bit skeptical, but after a few games, I was completely hooked. People often ask how we designed Prismata. As it turns out, the game’s unit types, combat mechanics, and economy were in a constant state of flux as we struggled through years of iterations of design, testing, and analysis. (Will and I shall discuss this process quite a bit in a few upcoming blog articles!) At its core, however, the fundamental rules of the game were not invented but discovered, almost completely by chance. Prismata’s unique combination of incredibly simple rules somehow, almost inexplicably, yielded emergent gameplay that was unexpectedly deep, balanced, and utterly fascinating from the very first time we played it. Magic Workstation is a program used by players of Magic: The Gathering to build and test decks online without purchasing any cards. To us, it was a windfall, despite merely being a tool for drawing groups of arrows, rectangles, and numbers. Magic Workstation allowed us to play Prismata online without exchanging cryptic alphanumeric messages or keeping track of gamestates on paper. It facilitated significantly more complex games, enabling us to design dozens of new units, test new abilities, and even concoct fundamental experiments in which we thoroughly altered the game rules. 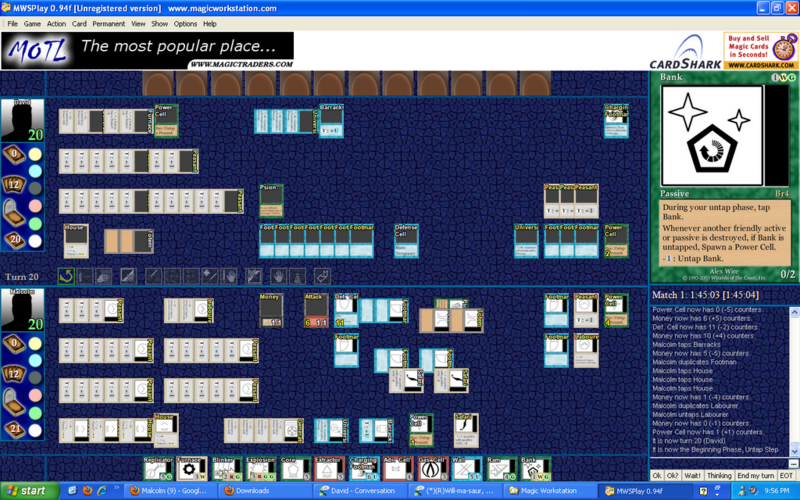 An early version of Prismata played using Magic Workstation. Alex informs us that we still owe him 30 bucks for buying the premium version of the software. Because we didn’t have to physically print cards or program their behaviour into the game, Magic Workstation dramatically accelerated the iteration process as we continually altered the game units, combat rules, and resource mechanics. Our group would meet online several times a week, playtesting a new version of the game every time. Some of the weekend play sessions would last until well after sunrise. As we made further refinements to the design, it became clear that, in its optimal form, Prismata would never work as a tabletop card game. There were simply too many units and too much information to keep track of. Even with Magic Workstation, much of the gamestate information had to be updated manually. 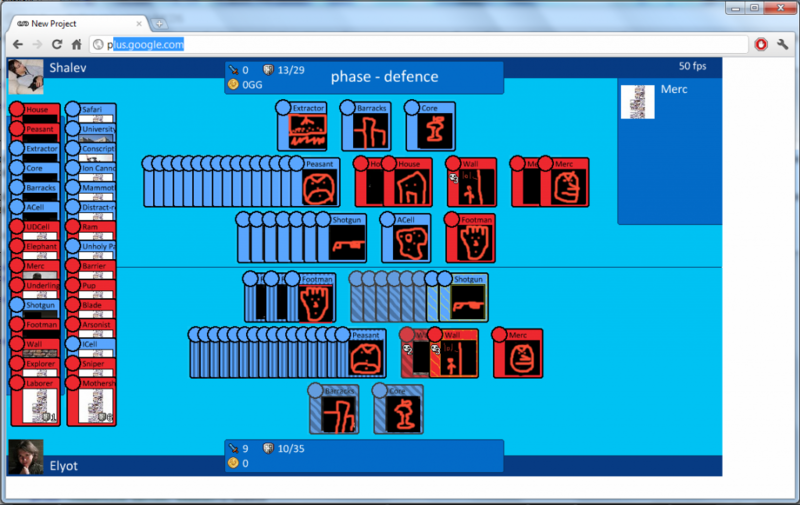 David had been working on a rudimentary GameMaker application for Prismata, but it was quite basic: units had to be clicked individually, there was no way to undo a misclick, and you had to manually enter your opponent’s IP address to play a game. The first version of David Rhee’s GameMaker client for Prismata, which he built while spending hours procrastinating on his master’s thesis. The card art, which we shamelessly stole using Google image search, has been replaced by doodles drawn by one of our artistically gifted co-op students. Display of units: there were so many units on the screen that it was necessary to overlap them, but this had to be done in a way that didn’t hide any important information. Undo: A simple undo system based on “going back one step” or “reversing time” was not sufficient, because players often wanted to change an action that they performed at the start of their turn, without reverting the rest of the actions they had entered since then. User Input: With so many units on the battlefield, players needed methods of assigning actions to multiple units at once. However, they also needed to be permitted to interact with each unit individually if desired. David: OMG OMG OMG. Alex’s swipe idea is the best thing ever. It feels so good to play with just the mouse. Everyone should try it right now. It was in the autumn of that year when I too began a PhD at MIT, studying theoretical computer science. I became Will’s roommate, which naturally fed our Prismata addiction further: the game became our pastime of choice, and we would play for hours—often whole weekends. David’s client made matches very quick to play, which made the game even more addictive, even though the software didn’t support very many units, gameplay modes, or features. Our dev team envisioned hundreds of features we wanted in the game, but most of them were well beyond the scope of David’s simple GameMaker application, which was already becoming difficult to manage as one hack after another was piled on in order to support a vast assemblage of game mechanics. Eager for an even better gameplay experience and better software that we could more easily modify as we developed the game, we resolved to gather back home in Waterloo during the holiday break at the end of 2011 to build a new Prismata application from scratch. This time, we wanted a full-featured online client, complete with its own back-end server that players could log in to. Through a week of intense hackathon-style coding, we managed to produce a working application from scratch! It’s quite likely that some of the code written in that first week is still present in the Prismata codebase. 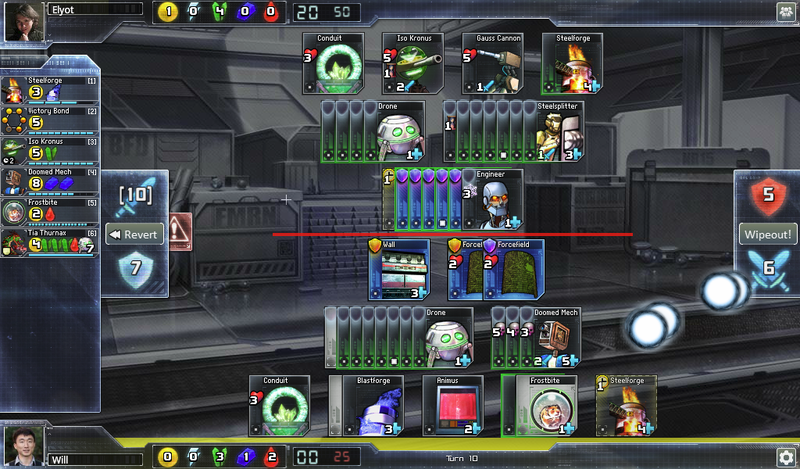 The first version of the Prismata game client as it looked in early 2012. Hopefully all the stolen art has been successfully censored by the co-op students. Prismata’s development continued throughout 2012, though we probably spent only 10% as many hours writing code as we spent playing the game and optimizing the design of the game to emphasize balance, fun, and depth. Our efforts intensified later in the year when Shalev and David joined us at MIT to begin PhD studies of their own. Almost every weekend, we’d all hang out at Will’s place, eat bad Chinese take-out food, and work on the game. We made improvements in many areas: game balance, the user interface, graphics, performance, etc. 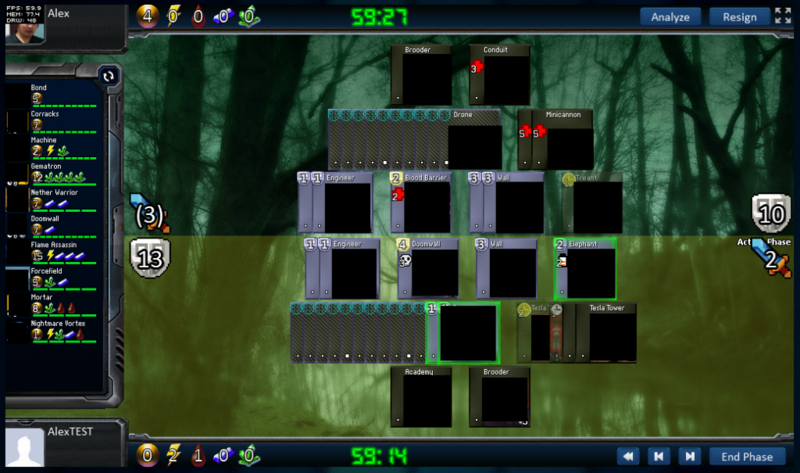 ; however, we also added many amazing new features: replays, play-by-mail, analysis mode, chat, and even some basic AI. On top of that, we tested dozens of variations on the game rules: drafts, constructed deck formats, and early versions of what would become raids. At this time, our plans for the future of Prismata were quite unclear and our development efforts were mostly focused on making the game more fun for ourselves. Of course, we always dreamt of working on Prismata full-time, but that never seemed like a real option, as we were all preoccupied with our PhD studies. On the topic of our PhD studies, there is a deeply personal aspect to this story as well. I had always thoroughly enjoyed the mathematical problem solving that I did as part of my work in algorithms and optimization, but it was sometime near the start of my second year at MIT when I found my interest in academic research quickly beginning to wane. Though I was highly successful as an academic, having over 15 publications before the end of my second year as a PhD student, I had many doubts about whether a future in academia would be satisfying. Much of my work was highly theoretical and unlikely to possess any practical value, but it also stopped short of answering key questions of notable theoretical importance. It felt needlessly masturbatory, as if I was simply farming citations for the benefit of nothing beyond my own academic standing. Though I was good at it, I didn’t really enjoy it all that much. Moreover, all of the background readings, teaching, paper-writing, travelling, slide-making, presenting, refereeing, and other busywork left me spending a surprisingly small fraction of my time actually doing hard mathematics—the one aspect of the whole ordeal that actually gave me enjoyment. I felt a bit betrayed, as if I’d been promised a job doing what I loved, but the job turned out to be an incredible grind, with only a few brief moments of truly satisfying work. Hence, like Will, I found that I actually enjoyed working on Prismata a lot more than I enjoyed working on my actual research. The key reason is that it was actually insanely challenging—the design of Prismata has genuinely been one of the most difficult projects that I’ve ever worked on, for a multitude of reasons. We wanted to keep all of the numbers in the game as small as possible, but this left us with very little granularity with which to make balance adjustments. Almost every design we tested for the core set of basic game units had long-term problems: rushing was overpowered, breaching was overpowered, massive economies were overpowered, players weren’t rewarded enough for attacking, defence was too weak or too strong, turns were too difficult because there were too many options, turns were too easy because there was only one correct play, and so on. We were forced to throw out a number of ideas that were interesting, but ultimately led to unfun situations in expert-level games. 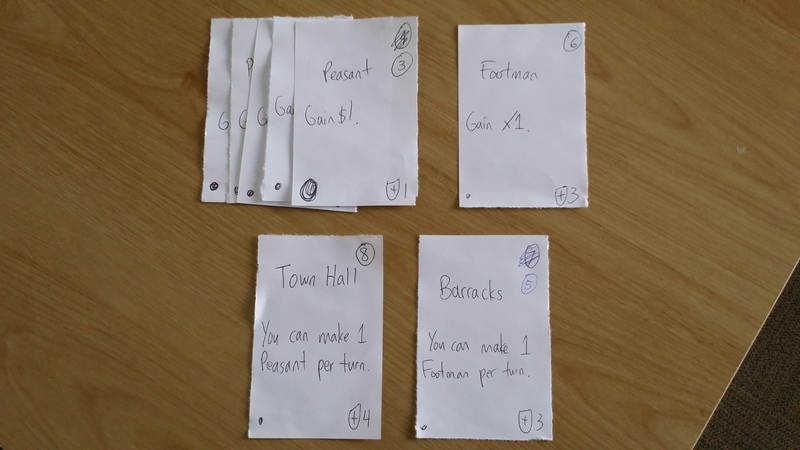 The game units and mechanics in our “trash pile” probably outnumber the units in the game by a five-to-one factor, and quite a bit of deep analysis was involved in culling the list of ideas and optimizing the ones that remained. This might be one reason why a game like Prismata has never hit the market before: the skill and mathematical prowess required to design and balance such a game is beyond the grasp of what most game designers can accomplish in the short amount of time they usually receive. It also made us—a team of MIT PhD students studying mathematics, algorithms, and optimization, with literally years of time on our hands—the ideal people to develop such a game. The five core economic units in Prismata. We probably spent over 1000 hours determining their final costs and exact specifications. RIP PhD. As it turns out, I was undeniably wrong about that. I never could have predicted what happened next. There was one key event that made me completely change my mind about Prismata. In the back of my head, for whatever reason, I had always felt (quite mistakenly) that Prismata belonged in the same category as our crazy, esoteric “classic Lunarch games”, like the others we’d developed during that first summer of intense gaming. Most of those games had little lasting appeal and were not remotely approachable to a casual gamer. But Prismata, after two and a half years of development, was a different beast altogether. I soon became convinced that our initial addiction to the game had been no fluke at all. How Prismata looked in 2013 after another year of 4 PhD students procrastinating. As usual, our dev art has been redacted. Damn lazy co-op student didn’t even bother drawing scribbles this time. The story goes like this: for two years, Will had organized and taught a for-credit poker class every January at MIT. Mike “Timex” McDonald—a famous poker player and close friend of Will’s since high school—had been invited to visit and give a guest lecture for Will’s class. After the lecture, we met up at Will’s place to hang out, and we were trying to decide what to do when Will suggested, “Hey Mike, want to learn Prismata?” Mike agreed to give the game a try. We taught Mike to play Prismata at 6pm. He didn’t stop playing until 9am the next morning, fifteen hours later. But that’s not where it ends. When Mike flew back home to Canada after his visit to MIT, he taught several of his friends to play the game. And they played almost daily, for months. We questioned whether this had been a fluke, but soon received an answer after we showed Prismata to other groups of people. Miraculously, over and over again, several groups of our friends began picking up the game and playing it regularly. Soon, we started seeing usernames on our server that none of us recognized. Some of them were on there for several hours a day. We started getting bug reports, feature requests, and zealous emails requesting changes to unit design and balance. We had actual fans! And they were willing to put up with our ugly, buggy software and teach their friends to play just so that they’d have opponents. For what was initially intended mostly as a personal “just for fun” project, this was a huge success! In addition to playing the game almost constantly, our fans showered us in glowing feedback. Mike McDonald told us that Prismata was the best game he had ever played (and he still seems to think so). Mike once told me that he’d probably lost tens of thousands of dollars in expected poker winnings by spending so much time playing Prismata instead. Prismata definitely had potential, but it would be quite some time before it would be ready for any serious release. The game had no tutorial, poor AI, bad graphics, and the server could only support about 20 people playing at the same time (it was actually running on the University of Waterloo Computer Science Club for most of the first three years.) Will and I talked about taking a break from our PhDs to finish the game and release it, but there were many complications: we’d need approval from our professors, we’d have to move back to Canada due to immigration laws, and most importantly, we’d need funding. It would also be a highly risky move, with the potential to be extremely damaging to our academic careers if we had a “gap year” in which we had no major publications and nothing to show for it. In the months that followed Mike’s visit in early 2013, we spent a couple of months in an ongoing debate over whether we should quit school, but there was one final factor that tipped us over the edge. Will and David attended PAX EAST—a gaming convention in Boston. It was there, on March 22nd, 2013, that Hearthstone was announced. David: It turns out to be a TCG in the Warcraft universe, coming out this year. Will: I tried it. I got fucked over by not having UNDOs. LOL. Alex: One thing is clear, I am drawing my focus away from poker to work on MCDS. Hearthstone was a game-changer. At first, we were a bit disappointed, fearing that we’d have no chance at all in the presence of a competing game by Blizzard. But there were also many reasons to celebrate—if Blizzard released a major turn-based online game that wound up being successful, it would likely pave the way for similar games like ours to become popular as well. However, if turn-based strategy games were to surge in popularity in 2014 and 2015, then we would need to move quickly to “catch the wave”. It was now or never. Prismata was certainly addictive enough to have a shot at becoming big. Would we give it a chance? me: So we’ll quit school, then? Will: I’ll do it if you will. And that was it. Will and I both submitted our withdrawal forms to MIT. David and Shalev, while electing to stay in school, promised us their full support. Alex, who had retired to Thailand after spending years travelling the world to play poker, moved back to Canada with us. And Lunarch Studios was born. Of course, the story isn’t over. There’s much more to be said about founding the company, raising money, and continuing the development of the game. We’ll cover that in future articles. We’ve come a long way since the early days of staying up all night to play MCDS over instant messenger, but our philosophy remains the same: build the game that WE want to play. Working on Prismata was what I did for years while procrastinating in graduate school, and being able to do it full-time is truly a dream come true. I feel absolutely privileged to be developing a game as interesting as Prismata with a team as talented as Lunarch Studios—I wholeheartedly believe that there has never been a more skilled team of designers developing a strategy game. The simplicity, elegance, and strategic depth of Prismata is completely unparalleled by anything on the market right now. I truly think that Prismata exhibits one of the most fascinating strategy game rulesets ever discovered. We really hope you’ll give it a try!